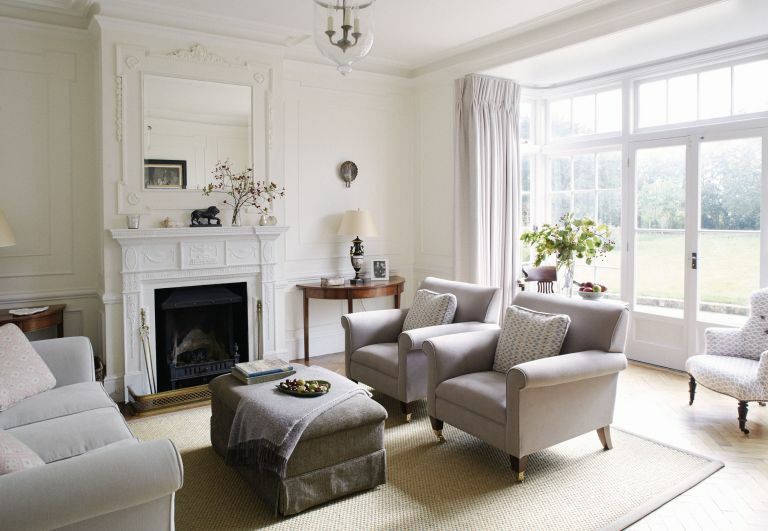 Louisa and her husband Charlie took on the renovation of a Grade II-listed five-bedroom cottage in north-east Oxfordshire. The house dates back to 1806, with the living room and master bedroom above added in 1902. Owners: Louisa Butters, a professional caterer, and her husband Charlie, an investment director, live here with their children Cecilia, six, and Hugo, three. What they did: The first big job was replacing the floor-to-ceiling windows in the living room and master bedroom as they were buckled and rotting. The house had to be propped up during the work. The also couple refurbished the master en suite and loft bathroom. Louisa and Charlie Butters had all but given up hope of finding their perfect country house. ‘We began looking when I was expecting our first child, and always wanted to bring up our children outside of London,’ says Louisa. However, after they spent months travelling between London and Oxfordshire, baby Cecilia arrived, and they still hadn’t found the right house. It was through habit, rather than with any real hope, that Louisa found herself scrolling through the property websites one Sunday evening. ‘There were all the usual houses, when I suddenly saw a new one in our search area,’ she says. Louisa’s instincts had been spot on. The location was perfect: minutes from Bicester, yet a rural idyll, the village had a gastropub and wonderful farm shop. Pretty as a picture, the house sat on the edge of the village, its own secluded garden backing onto rolling farmland. Built in Cotswold stone, with early-19th-century origins, it had high ceilings, big windows and plenty of period features, as well as, most importantly, a welcoming, peaceful character. Homeowner Louisa Butters loves exploring their Cotswold garden with children Cecilia, six, and Hugo, three. In late June 2009, the family moved in, to enjoy their first glorious summer in their country home. ‘The big garden was amazing. It was a very hot June and we had so many barbecues,’ Louisa says. They painted the house in pale, neutral colours to lighten it, and had new ceiling and wall lights fitted to replace the spotlights favoured by the previous owners. Louisa has a flair for interiors, and her best friend Bee O’Connell, an interior designer, was there to help when decisions were needed. Together they reintroduced as much of the house’s period character as possible, while keeping it contemporary for the family’s lifestyle. For four years, they made do, but when caterer Louisa was offered a new permanent position, and with another baby on the way, she longed for a more spacious, practical kitchen. Work on upgrading it started in August 2012, with baby Hugo born a month later. The building’s listing prevented the couple from knocking through the wall of the utility to expand the space for a family kitchen, so they made the connecting door wider and had the family kitchen-diner built alongside, in place of the old kitchen extension. With its roof lantern and tall windows, it is lighter than the other half, but the lofty ceilings of the two blend well. There is now a cosy kitchen-diner where the kitchen used to be, and the utility next door has been gutted to transform it into a food preparation area. ‘This had a low ceiling with a small room above, which was removed to raise the ceiling to the rafters,’ says Louisa. With destruction came discovery, as the builders unearthed a pre-1900 range cooker, implying that this room had once been the kitchen. Renovating their home has awakened Louisa and Charlie’s interest in its history. They have since learnt that it was originally a smallholding farmed by monks, and it has been the site of a hunting lodge for the Royal Equerry.